As emphasized in the previous chapters, web ontologies are being developed and deployed to describe information in a semantically rich fashion, but to benefit from the deployment of ontologies, it is important to understand which components of an ontology are being used and how they are being used. Such understanding can improve the utilization of Semantic Web data and allow its potential benefits to be realized (Baker and Herman, Semantic web case studies and use cases, 2009, ). In the previous chapter, we discussed the existing literature, which measures “usage” with a greater focus on understanding RDF data in general than from the perspective of analysing how ontologies are being used to represent that RDF data. To address that drawback, we present our proposed Ontology USage Analysis Framework (OUSAF) in this chapter. Section 3.2 presents the notations used in this book. In Sect. 3.3, ‘Ontology Usage Analysis’ is defined and key terms used in the definition are discussed in detail. 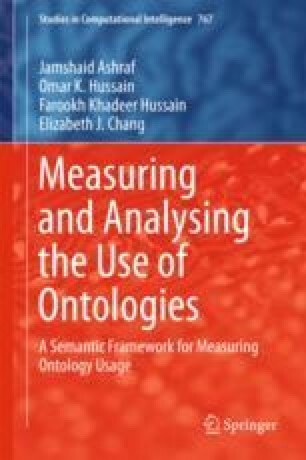 Section 3.4 describes the different phases of Ontology Usage Analysis framework and the purpose of each phase. In Sect. 3.5, each phase of the framework is explained in detail. The conclusion of the chapter is presented in Sect. 3.6.